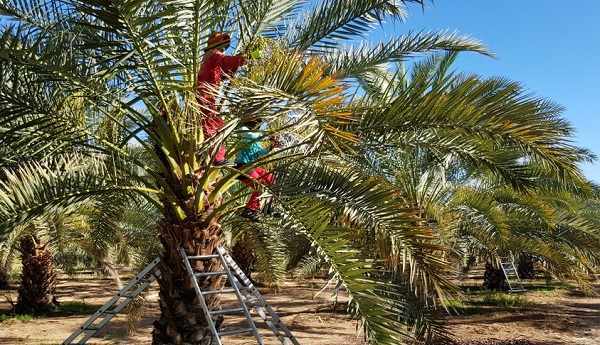 Bahri dates exported fresh, are a key element of Desert Fruit Namibia’s strategy to make inroads in the Middle East market and in Muslim countries in Asia. This week the local grower’s Managing Director, Seth Holmes, said they are focussing on the Bahri cultivar and are expecting a much bigger harvest come end of January next year, when the fruits start to ripen. “Our focus has been to increase quality and date size, pushing the envelope of the delicacy market. The young trees are reaching production maturity and the tree health is reflected in the fruit quality,’ he said. Revealing a little of their adapted marketing strategy, Holmes said they will introduce new one kilogram packets of loose, fresh Bahri punnets in addition to their 5kg carton. “This is meant for convenience shopping at the retailer and we are excited about this addition to our product range” he said. Desert Fruit Namibia is one of only a handful of known producers of fresh Bahri dates in the southern hemisphere. While Bahri is relatively unknown in Europe and the United States, they are a delicacy in the Middle East and demand from Asia is rising. Holmes said that buyers have already started placing their orders for the upcoming season and more orders are expected as last year’s produce, exported to the UAE, Malaysia, Indonesia, Maldives and Switzerland, received an excellent response in the market. “The produce will be harvested from late January to the end of March and it is looking good as we are able to deliver Bahri for an extended season to all our customers,” commented Holmes. The Bahri date is traditionally eaten fresh as a crisp, sweet fruit. Some consumers though, prefer to let the fruit age, preferring the soft, cured dates instead of the freshly-picked product.